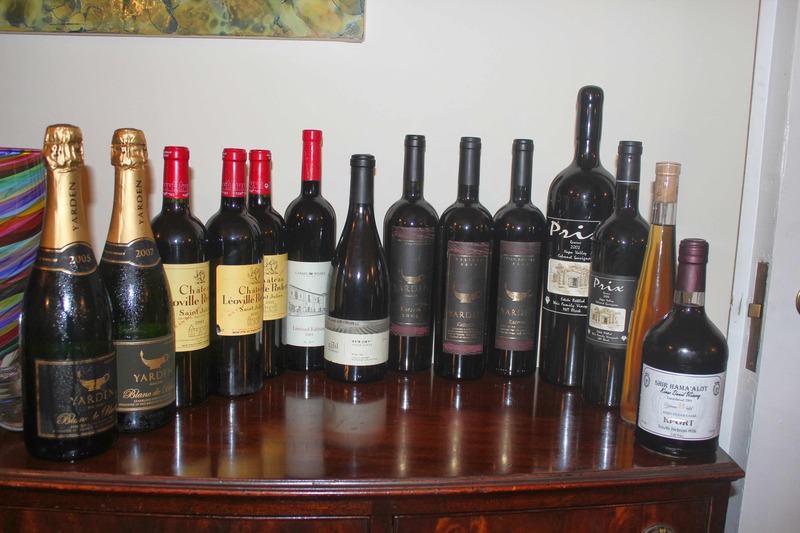 Over this past Rosh Hashanah, I challenged myself to gather one of my favorite wines and enjoy them all in a controlled and non-drink-off manner. As explained in my last post, I did not want to make the wine the center of my attention on Rosh Hashanah, the day where we and the world are judged. So, I slowly enjoyed bottles through the 6 meal event (Friday night was attached to this year’s Yom Tov schedule making for a three-day festival set). So, the first night we enjoyed the Alvi Ness Blanco, the next day we opened another bottle, but more on that one in a separate post to follow this one. The rest of the wine we enjoyed from there on were all Zinfandel wines, culminating in the true Zin-off on Friday night, following the Jewish New Year! On the Shabbos, I let my hair down a bit, and we enjoyed tasting 6 Zinfandel wines, all blind, all kosher, in a classic wine-off. To be honest, I have never had the chance to taste the “real” California Zinfandels, Ridge, Ravenswood, Rosenblum, and Turley. Why? because NONE of them are kosher, which is a real shame. So, I tried to get together whatever kosher Zinfandels I could. 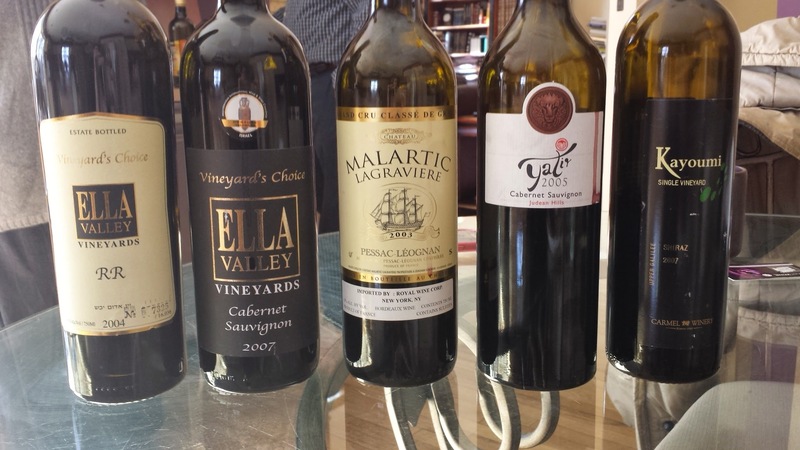 The largest producer of kosher wine, Israel, has a very poor track record when it comes to Zinfandel, and neither of the wines we tried from Israel, both from Dalton, made it into the top 5. California continues to be the kosher Zinfandel producer and even in the non-kosher world, California continues it reign over the world that includes Italy and Croatia. Originally, Zinfandel was thought to be an American grape, but recently that theory has been dispelled by the likes of U.C. Davis, who have done DNA testing and found out that Zinfandel and Primitivo (a grape of Italian origin) to be one the same. With even more efforts from UCD professor Carole Meredith, it was found that Crljenak Kaštelanski (“Kaštela Red”) appears to represent Primitivo/Zinfandel in its original home, although some genetic divergence may have occurred since their separation. Meredith now refers to the variety as “ZPC” – Zinfandel / Primitivo / Crljenak Kaštelanski. While, the true origin of Zinfandel grape may be Croatia, California owns the title of the best Zinfandel wine – the world around. Two weeks ago, before I left for all of the Royal wine events, I went searching through my cellar for more Petite Sirah wines to make up for the sleeping beauties (at least they were beautiful before) I had to endure two weeks ago. Two weeks ago I posted about my failed attempt to find great Petite Sirah wines. Why? I do not know, these wines used to be great and I doubt they are dead, but rather in deep sleep. So, I tried to open all the Herzog Petite Sirah wines I had to see if they were any better. 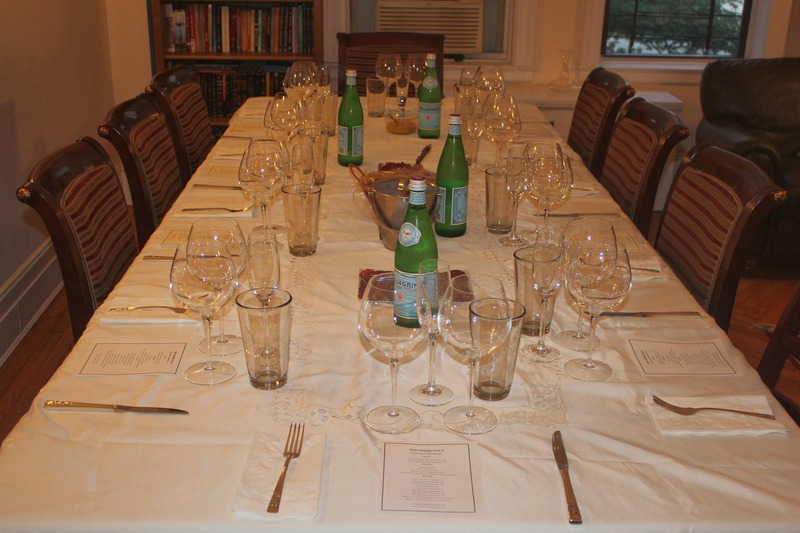 We did have a Herzog petite Sirah two weeks ago – the newest Herzog Petite Sirah that has been released, the 2010 Princeville PS, and it too was so-so, again I think something was wrong with my bottle or I and the rest of the table had an off day. So, I tried a different table of people (mostly) and a different set of wines, and these came out better, but not awesome, other than the 2009 Baron Herzog Petite Sirah P.S. Limited Edition! That was a beast of a wine and lovely. The clear take away here is that these wines need a lot of time in a decanter and only then are they ready to play. Along with PS wines we also enjoyed three older wines from the Four Gates Winery, and a bottle of the 2005 Galil Yiron. 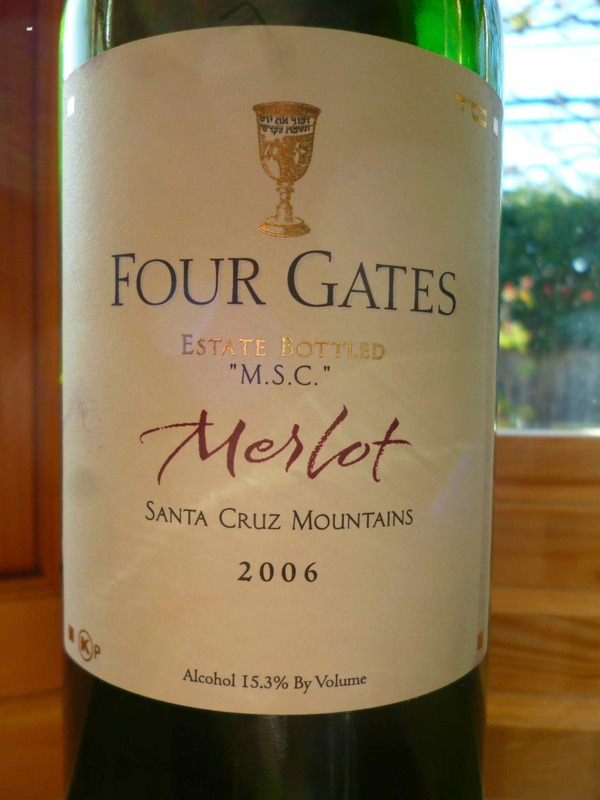 There was talk that the 2005 Yiron was going down hill, and I can say that the wine is fine and going nowhere but it was shocking when tasted side by side the 2005 Four Gates Merlot M.S.C. The Merlot was bracing with black fruit and acidity, while the Yiron was full of black fruit but flat in terms of acidity, and I think that is what people are concerned about the Yiron. The Yiron is much like many of the older Yarden or Galil wines, they are flabby, oaky/cedar, and black ripe/sweet wines. If you look at the kosher wineries in California, the majority exist here in Northern California. 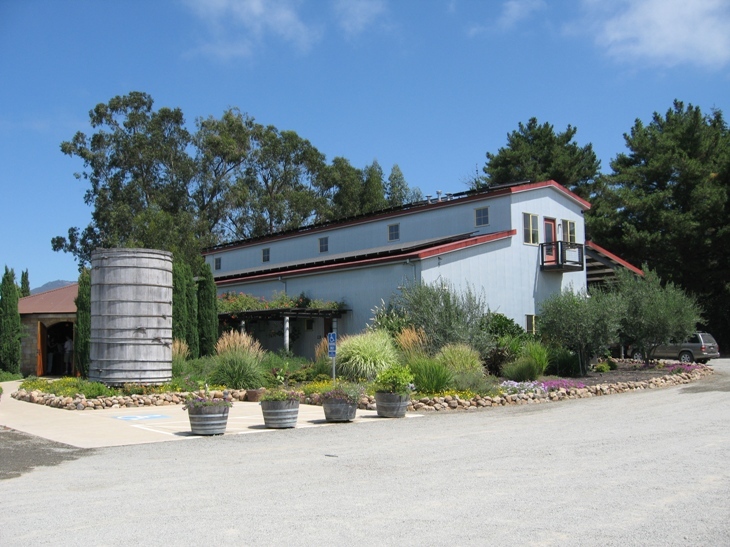 Down south you have the famous Herzog Winery in Oxnard, CA, and a pair of wineries that I call ADS (Agua Dulce & Shirah), for the Agua Dulce Winery and Shirah Winery, both housed in the Agua Dolce Winery. While this is great, Northern California one-ups them with Four gates Winery, Hagafen Winery, Covenant Winery, and the Brobdingnagian Winery. Of course you can actually combine all the California kosher wineries (except for Herzog) into Herzog’s parking lot (a nod to Disneyland and Disney World). Well the adventure started late last week, when Elliot (Eli) and Michael (Yoav) both visited Benyo and Four gates Winery without me – go figure! However, on Monday I met both Elliot and Michael at my house and we started driving our way north. For this fabulous adventure our chariot of choice was a lovely Buick La Sabre, which before you start laughing, is a crazy and sick car to drive and drive-in. This car was appointed in soft leather, all kinds of toys and warning systems and a great navigation system that got us to and from our desired destinations, in comfort and style, and on time. The day started out as a lovely and sunny Sunday, the last one of 2009. We took a long and enjoyable last look at massive Clear Lake, which our hotel wrapped around, and headed south on CA-20. As we closed into Lower Lake, we were supposed to continue south on CA-29, but plans are just that – plans! Instead, we took the road less traveled, the Knoxville-Berryessa Road (lovely pictures of the road linked here from a motorcycle rider). It is so called because, it is a road that runs through government-owned land, counted some 5 or so structures from Lower Lake until Berryessa Lake. For some 30 or more miles, at a rate of maybe 35 mph, we saw no one – period. Truly a road less traveled. Finally, and blessedly, right before Lake Berryessa, we came upon a truck, and two folks fishing (actually, I think that was not public knowledge :-), and they told us where we were. I guess this teaches us, that if we do not want a GPS or expensive phone contract (with GPS on it), and instead want to go retro, we should act retro, and carry around a map or two! Well after a fair amount of driving, we came to the Hagafen Winery, a bit late, at a not so warm time of day. It was some 40 degrees outside, and we went inside to meet Josh Stein, Hagafen Winery’s Brand Manager. I stated the temperature, because Josh started the winery tour outside where every vintage starts – in the vineyard of course! I asked about the way the vines are managed, and Josh quickly replied that the vines have been managed using CCOF (California Certified Organic Farmers) rules for many years now, but they are now in the second year of their CCOF certification, and hope to be certified within a year. Of course, as we have spoken about this topic many times, the wine will NOT be organic, but the vineyard will be. There are three full time employees, Ernie Weir, the owner and founder of Hagafen Winery, who is also the manager of the winery. The other two full time employees, manage the winery’s most important other asset, the vineyards. The winery started some 32 years ago, after Weir had made wine, at a custom crush site in Napa, CA, for a couple of years. He decided to start making kosher wine. He started his production with 25 cases and a single SKU. 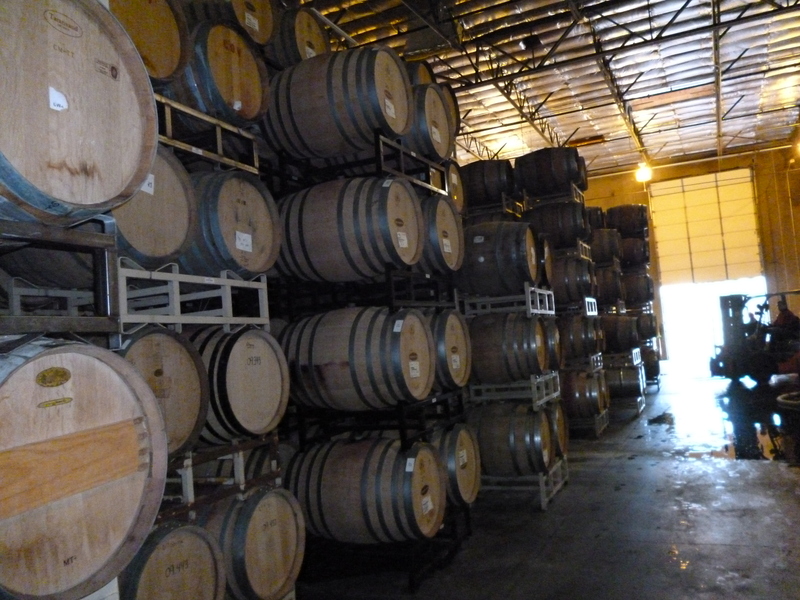 Today, Hagafen makes some 8000 cases of wine, under three labels, and 30 or more SKU. Hagafen started with no vineyards, and then in 1986 they bought the land that the winery sits on presently. The vineyard in those days was planted with Pinot Noir and Chenin Blanc, but it was replanted in 1997 with what stands there today, 12 acres of clone 7 and clone 337 Cabernet Sauvignon, named the Weir Family Vineyard II. The Weir Family Vineyard III came online later with 9 acres, 3 acres of Cabernet Franc, 3 acres of Syrah, and 3 acres of White Riesling. Many of Hagafen’s wines are labeled as Estate Bottled, though they are not actually on their estate at all, as seen here on Hagafen’s vineyard map. They source grapes from vineyards as far south as Fagan Creek, and as far north as Soleil and Moskowite vineyards. So, how are they allowed to use the term “Estate Bottled” on their labels? Well, the rules are a bit more simplistic, though not well known. As described here on the Alcohol and Tobacco Tax and Trade Bureau (TTB), the Estate Bottled tag line has three requirements to be added to your label.